A selection of artisan home decor, original handcrafted accessories for interiors. Earlier this week in Tubs of Color, Jane touched on the International Contemporary Furniture Fair (ICFF) which took place in New York City. The show focuses on the latest and greatest from around the globe including artisan home decor. Washington State-based Grain Design is introducing their scooped tabletop Dish coffee and side tables. 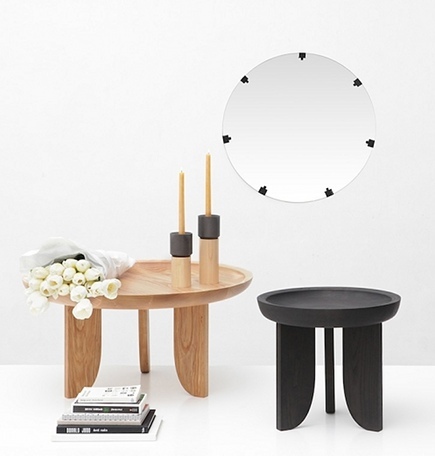 The pieces are made of solid American ash, shown with clear oil and black satin finish. Custom finishes are also available. The water jet cut mirror is another new creation. The mirror is hand stitched to its backing with hemp twine. Each piece is made to order, allowing the twine color to be customized. 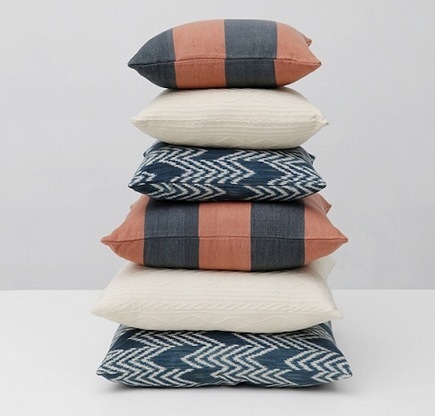 A new textile collection features pillows made exclusively with naturally dyed cotton by Guatemalan artisan communities. Bold stripes, chevron and graphic pattern pillows are available in two sizes. Check the Grain Design website for online and local retailers.